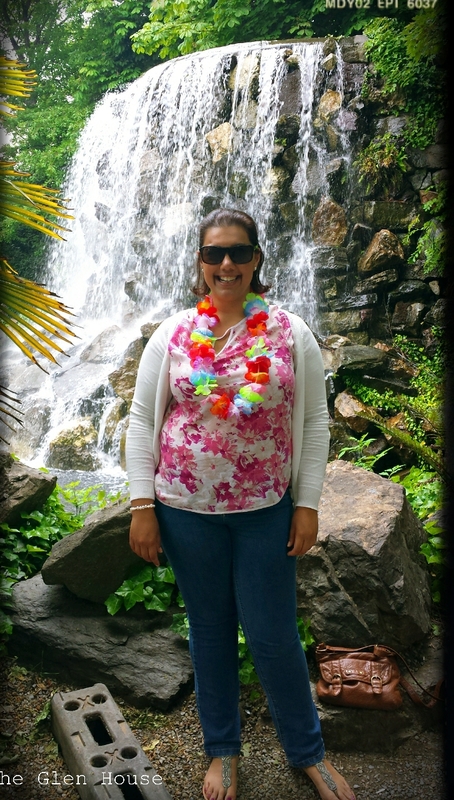 So, you all know that I had a fantastic time in Madeira. It goes without saying that I brought a few goodies home. Thanks to Celia from Fig jam and Lime cordial for gathering us all together. … Are three small bottles of rum. I thinking that they might be good in this year’s Christmas cake. I also brought home three bottles of Poncha! 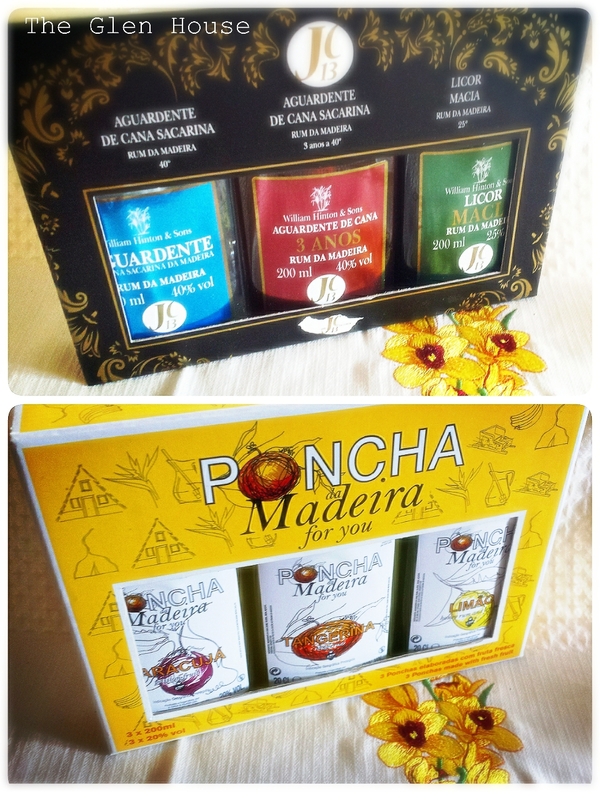 Poncha is a traditional alcoholic drink of Madeira; made with sugar cane juice, honey, sugar, lemon rind and with other fruit juices. 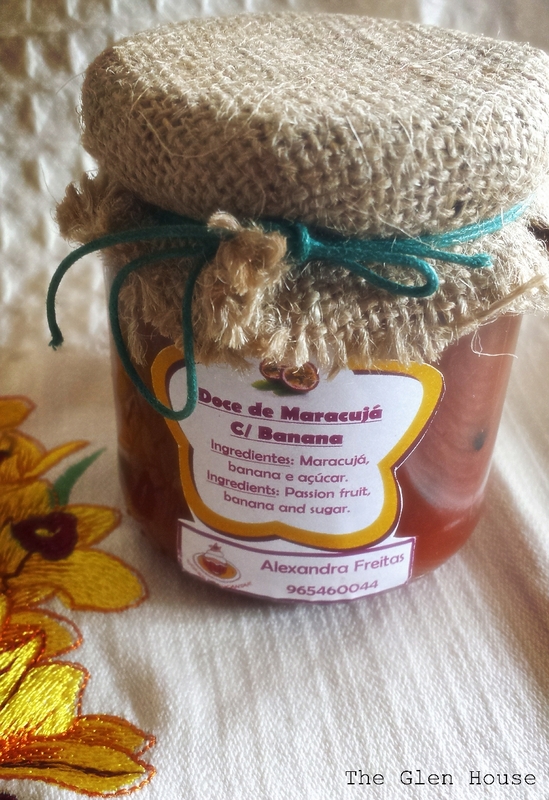 … Sits a jar of homemade passionfruit and banana jam, which was bought from a little market in Funchal. … Is a piece of honey cake. 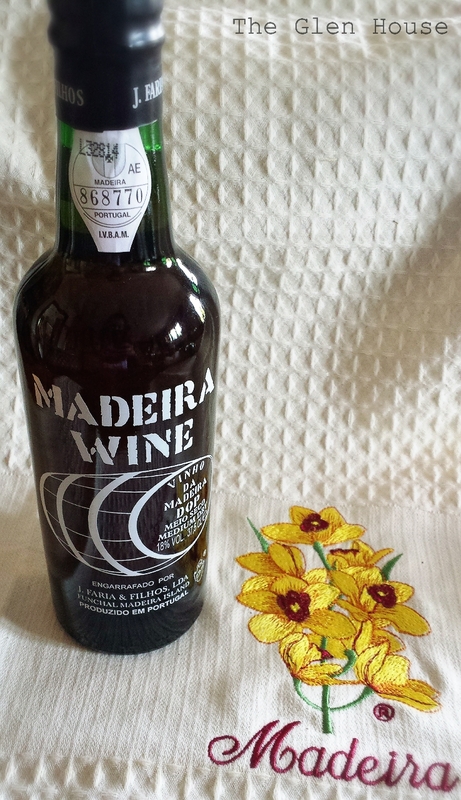 Madeira Sugar Cane Honey Cake is the oldest and most traditional pastry cake in Madeira. The influences include spices from the East Indies and even influences from Britain, given its strong resemblance to English traditional Christmas cake. 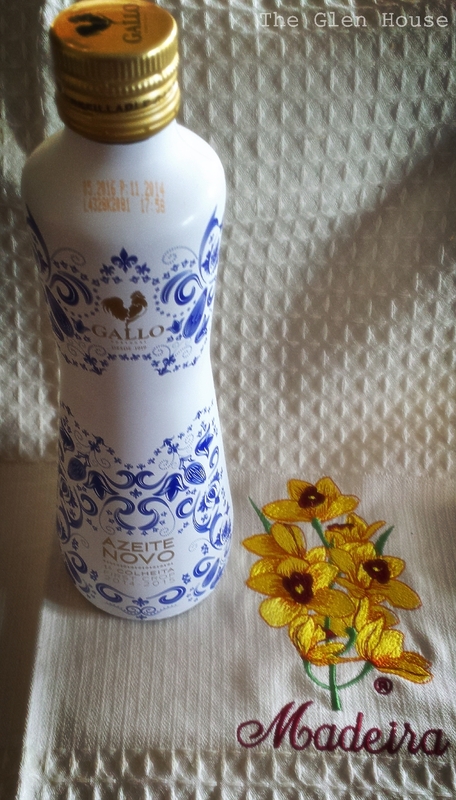 … Stands a rather beautiful bottle of Portuguese olive oil! 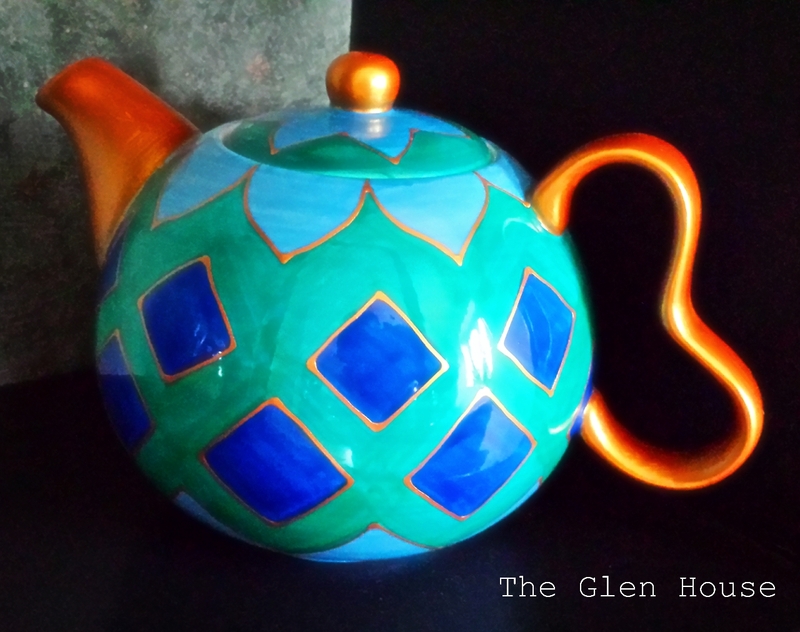 … Sits this stunning teapot that Dr Doolittle bought me. In the middle of Funchal, up a side street was this cute little tea shop! 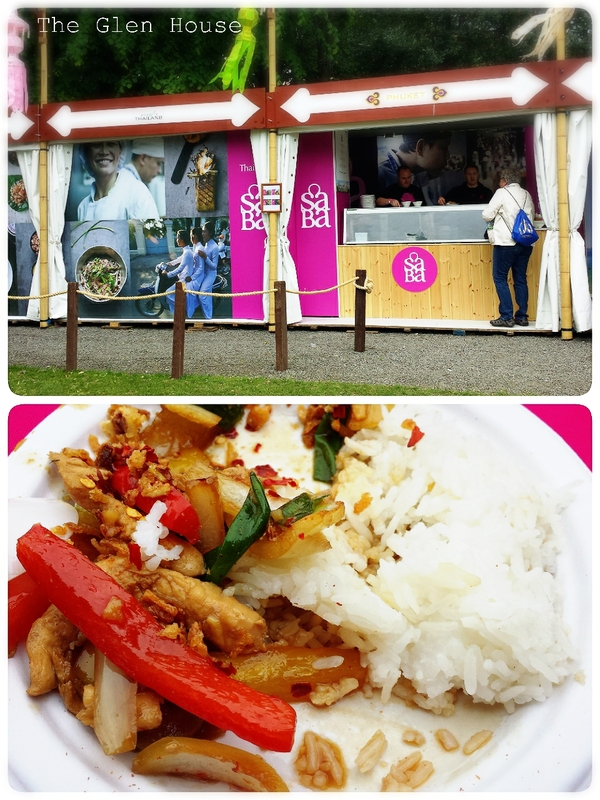 I went to Taste of Dublin in Iveagh Gardens yesterday. There were live bands playing as I wondered around from restaurant to food stall. There were also lots of live demonstrations and famous chefs! I started with cake, of course I did! 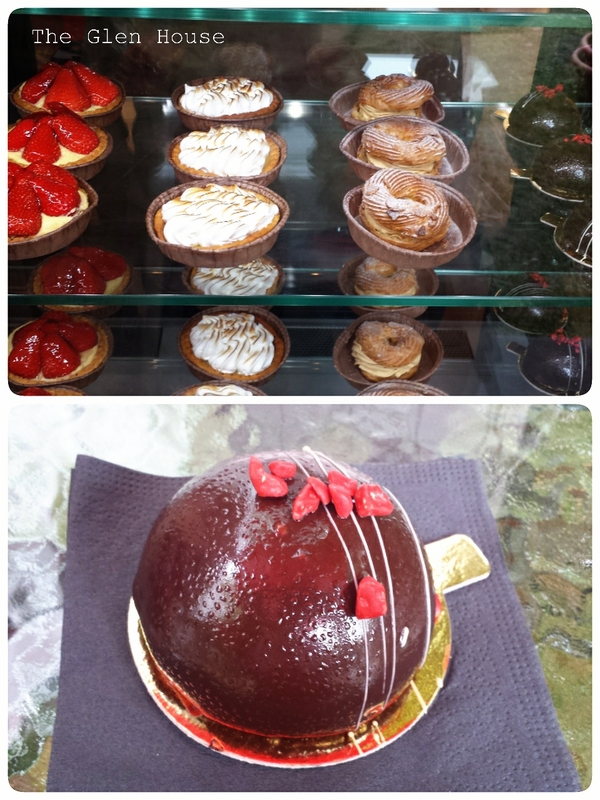 Le Patissier had an amazing display of goodies. They had won both Gold and Silver at the Blas na hEireann Irish Food Awards in 2014. I tried the chocolate indulgence which had a beautiful chocolate mousse inside with a raspberry coulis. I wish I’d gone back to try everything. 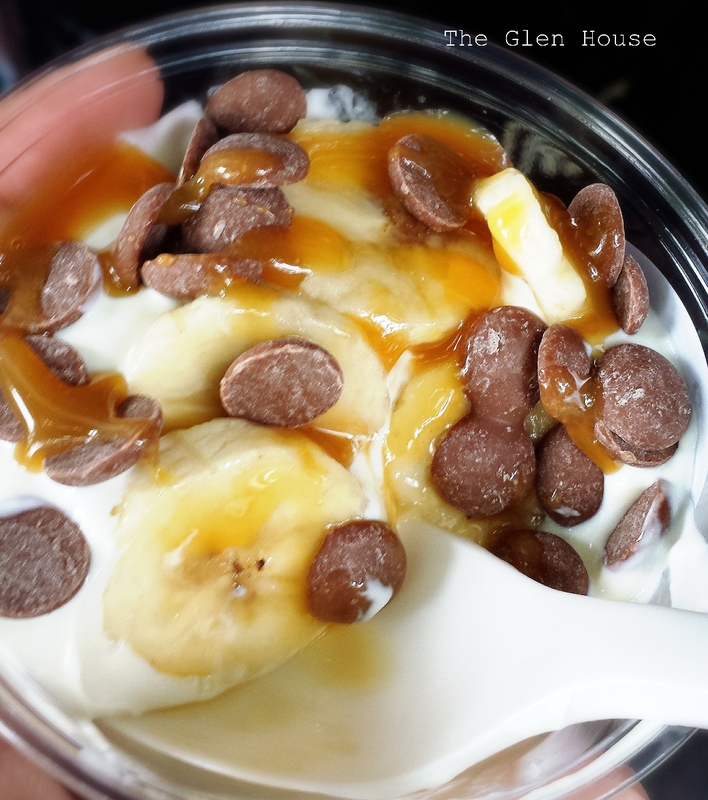 I visited the Glenisk stand and got a scrummy Glenisk Banana with Milk Chocolate and Caramel Yogurt Cup! I had a great chicken dish at Saba, how do they do their rice? 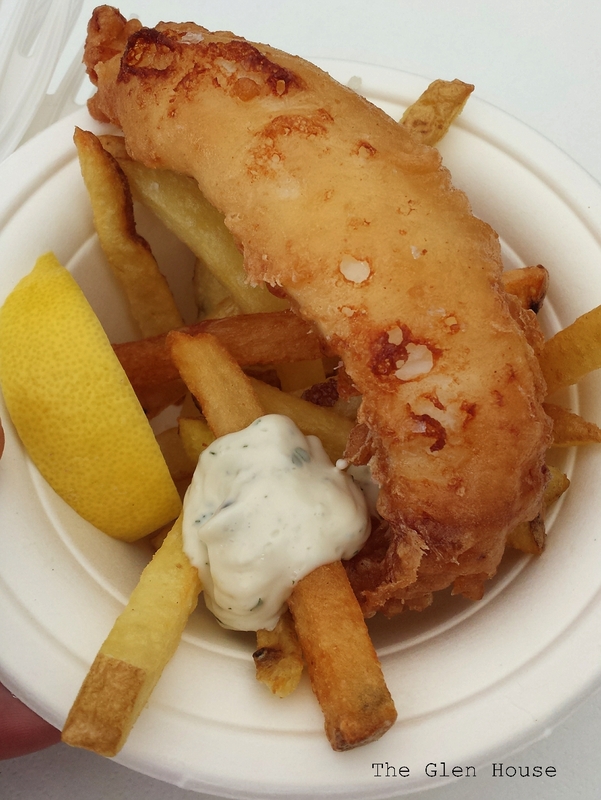 Harvey Nichols’ restaurant Rock Lobster served up fish and chips… Shame some of the chips were hard! 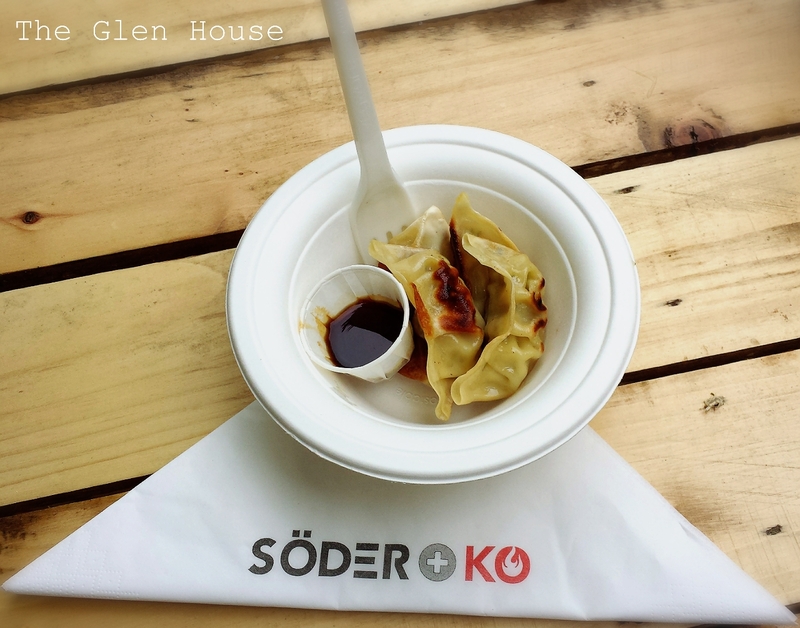 The Dumpling Pot Sticker from Soder and Ko was amazing. I’ve never been to the restaurant, but I definitely will be! 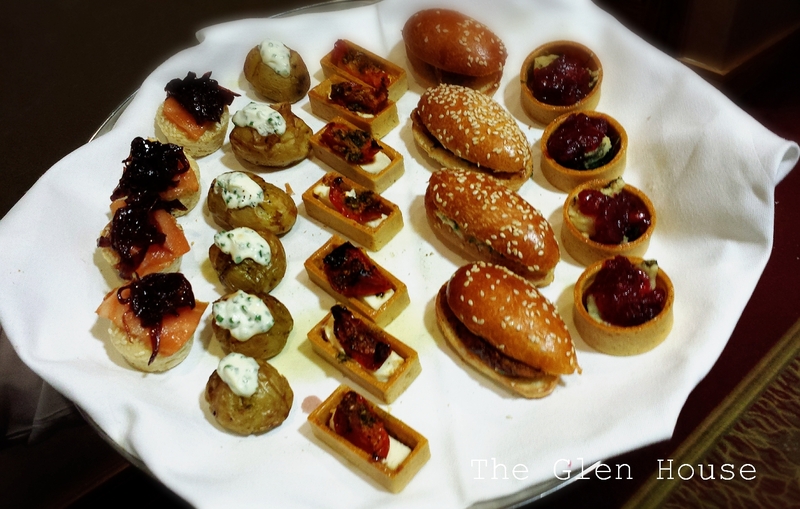 They serve a creative blend of Scandinavian and Asian inspired food and drink. They partnered with Hop House 13, the latest beer from The Brewers Project at St James Gate. 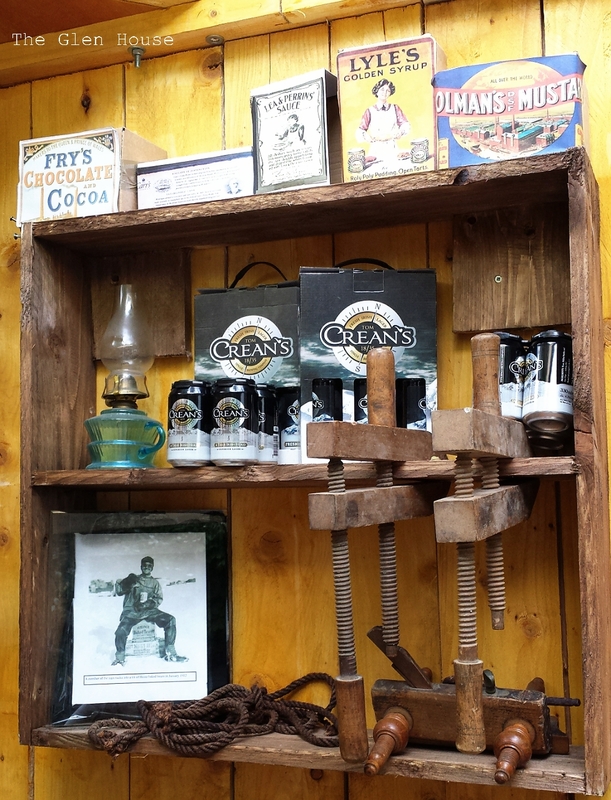 Dr Dr Doolittle really enjoyed Crean’s beer AND their little make shift pub! 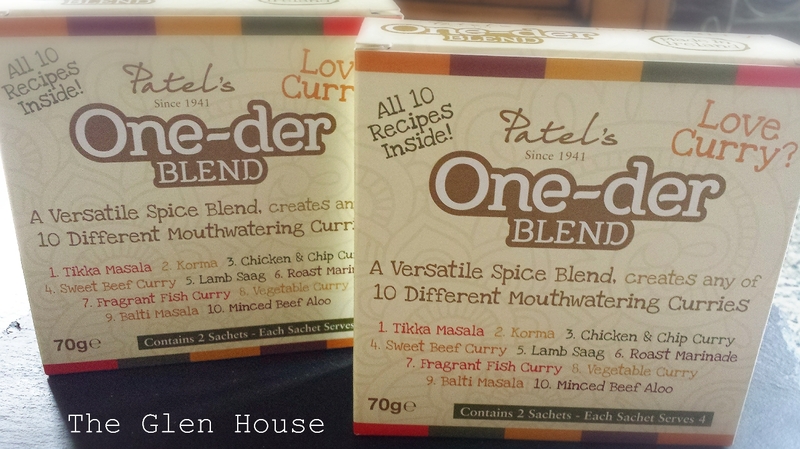 I bought a couple of packs of One-der blend by Patels 1941. It’s a versatile spice blend that can create 10 different currys. What a fantastic idea. I also love the fact that Ramen Patel Jr’s background is similar to mine; born in Ireland with an Irish Mother, and Indian Father who was born in Africia. The company had won a competition to have a stall at the event and it seemed to be very busy. I’m so excited for them, and wish them every success! 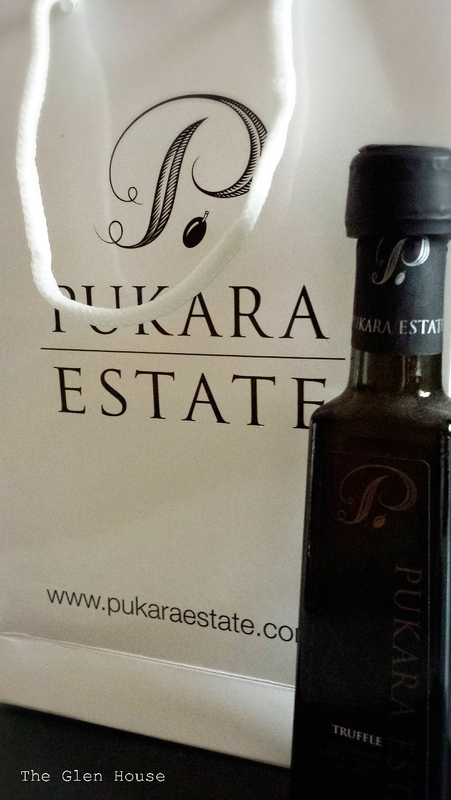 I bought a bottle of truffle oil from Pukara Estate…. fancy!!! I met The Cupcake Bloke! 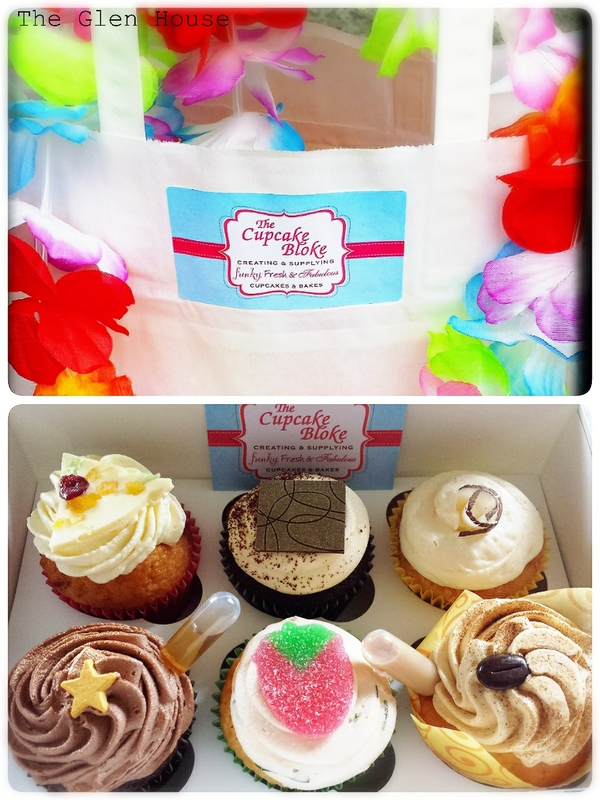 He gave me a garland (and a huge scone), and I bought these six stunning cupcakes. I’ll update you all on my Facebook and Twitter page as I eat them…. I had a great time but I spent a lot; it wasn’t cheap when you consider the ticket price, the food and drink prices and then any bits and pieces you might buy, but it was fun! 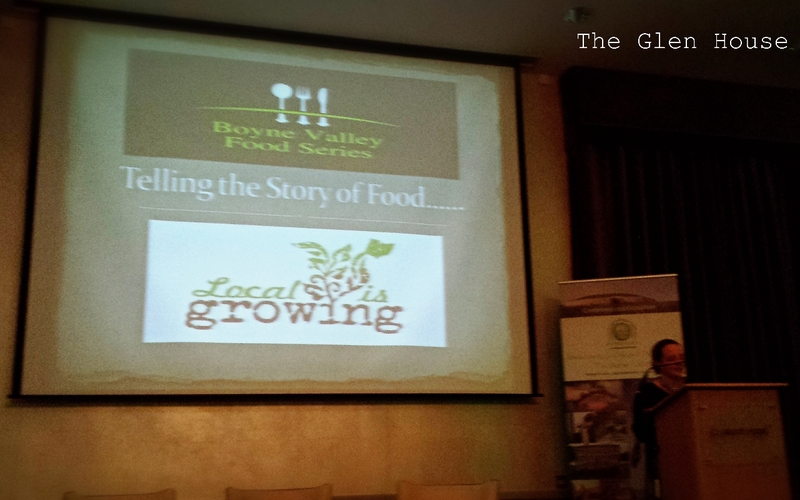 Last Friday saw the launch of the 2015 Boyne Valley Food series, as part of the Boyne Valley conference. Spread across the counties of Meath and Louth, the Boyne Valley encompasses world renowned heritage sites including the World Heritage Site at Bru na Boinne, the Battle of the Boyne site, Trim Castle and Mellifont Abbey. To me, the area is beautiful; green and lush, the way you’d expect Ireland to be and crammed full of sites and ruins. I have my favourite foodie destinations and local artisan products, but never before had I realised just how much my little part of the world had to offer. 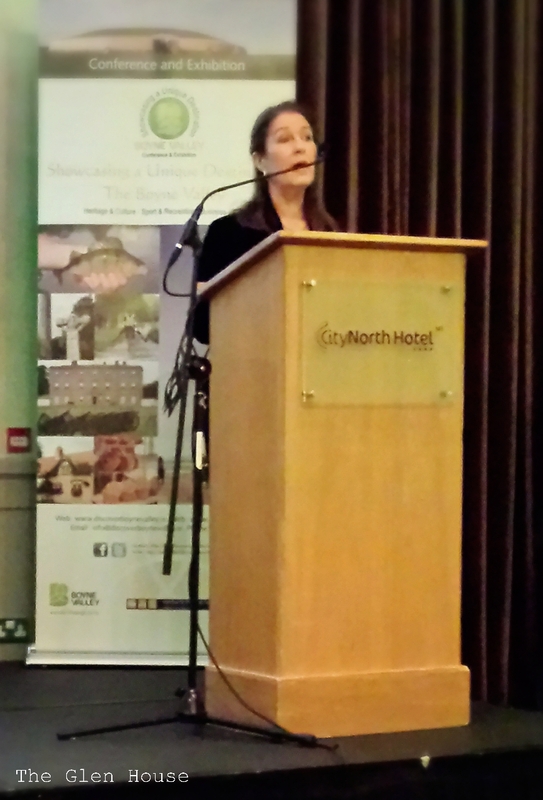 The evening was introduced by distinguished food and hospitality writer Georgina Campbell; she explained that “food tourism has huge potential” and that the Boyne Valley region has “history and mystery” on its side as it looked to the future. However she urged that more interest was needed from cafes, pubs, hotels and restaurants in order to showcase the wonderful produce to the public. 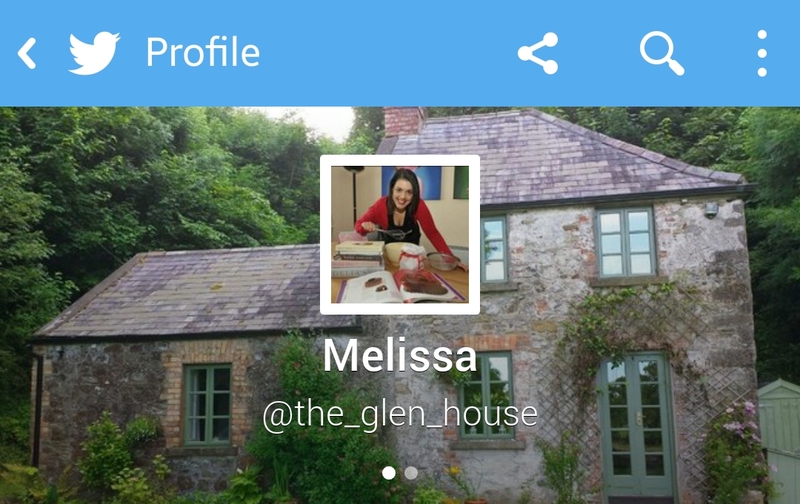 Slane Bake; my cute local bakery who do yummy breads and gorgeous tarts! Blast and Wilde; winners of Supreme Champion at the Blás na hÉireann 2014 Awards. Morgans Fine Fish; who have been in business for over 150 years! Burke’s Farm; makers of delicious Jersey milk ice cream and sorbets (and my new best friends)! The Whole Hoggs; who keep the very rare breed of Irish Grazer, making their own sausages, rashers and rather yummy pudding! 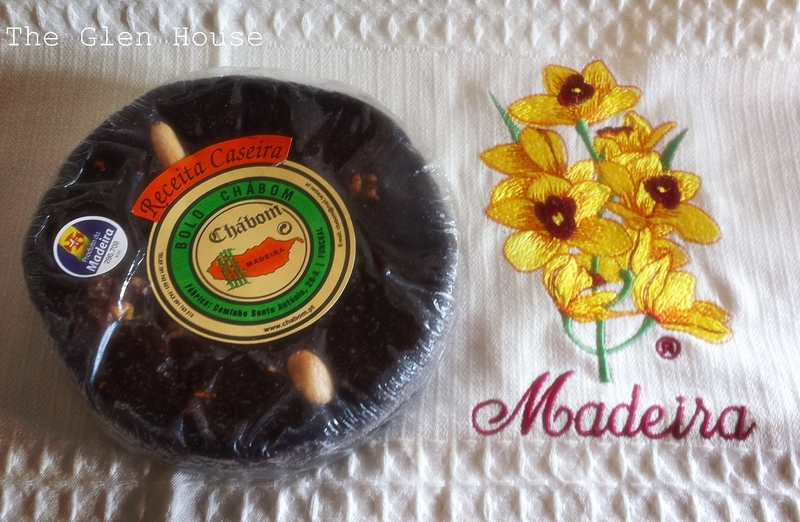 Meade Potatoes; producers of potatoes, fruit, vegetables and flowers. 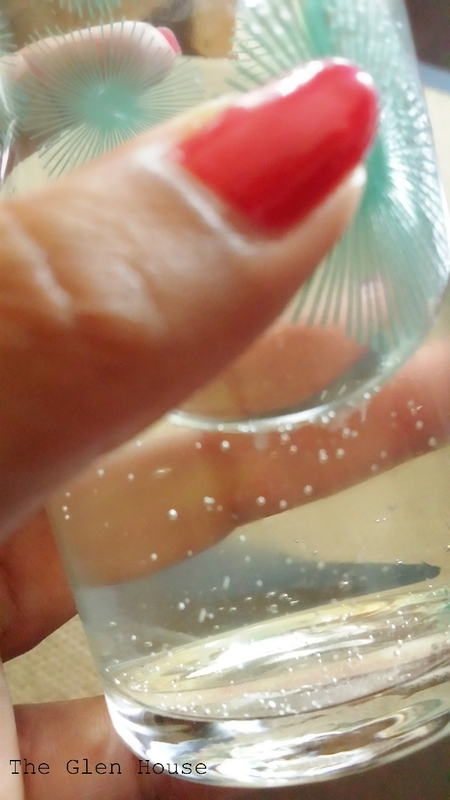 The Oriel Sea Salt Company; “located on one of the world’s most beautiful and mesmerizing coastal headlands with the mountains of Mourne in the distance. This is the actual birthplace of Ireland and it must be seen to be believed”. Glyde Farm Produce; producers of Bellingham Blue Cheese. 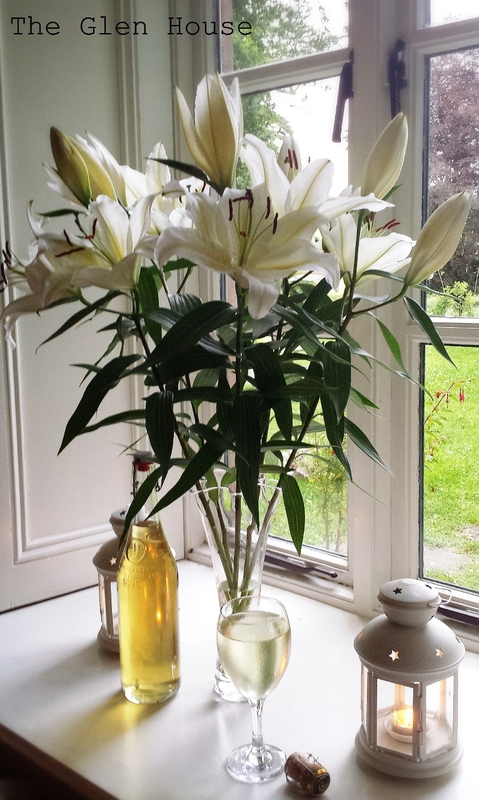 Lannléire Honey; locally produced from the natural flora of county Louth by native Irish honey bees. 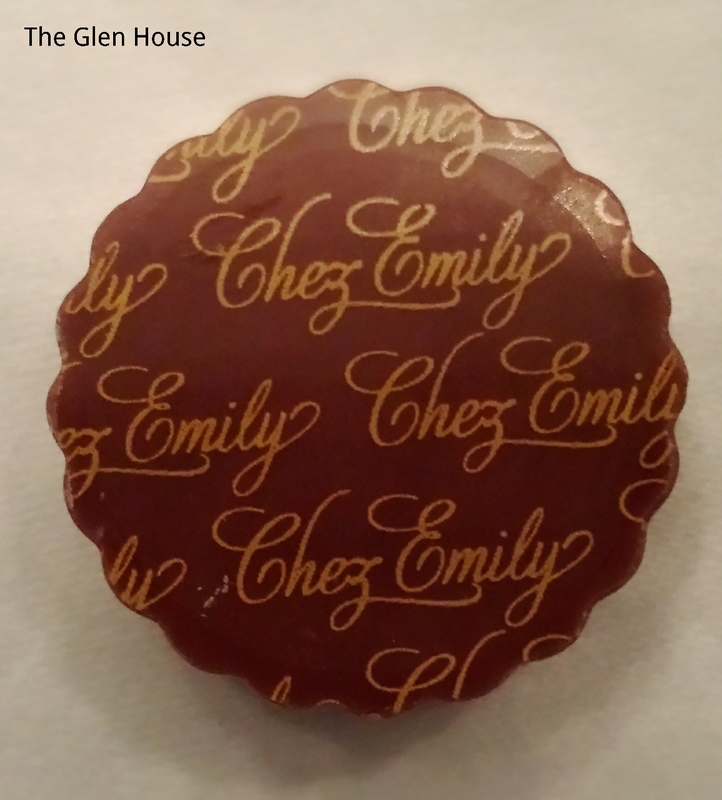 Chez Emily; The couverture chocolate used is from Belgium and is a high quality chocolate that contains only cocoa butter. No substitutes or additives are used in the chocolate in place of the cocoa butter and this gives the chocolate a creamy mellow flavour, a shiny appearance and a snappier snap! 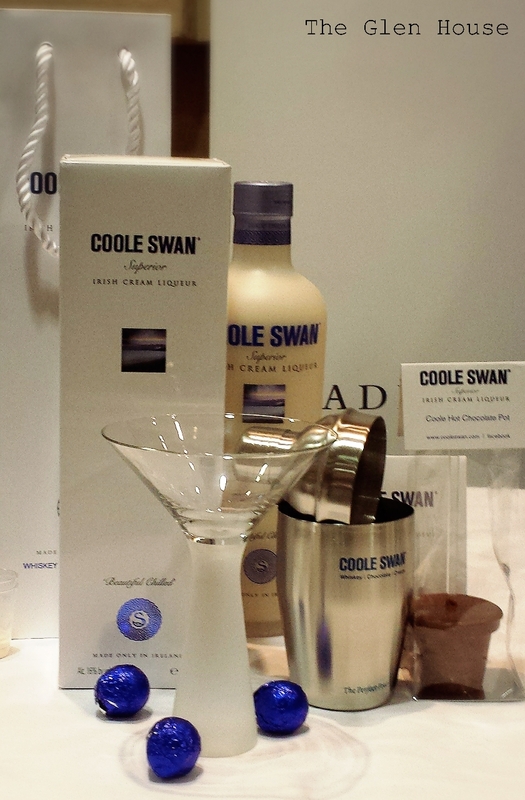 Coole Swan Superior Cream Liqueur; Coole Swan was born by blending the finest Single Malt lrish Whiskey with White Belgium Chocolate and Fresh Cream. Slane Castle Whiskey; a small batch, premium blend of Irish single malt and grain whiskeys which are made and matured in the traditional Irish style that has remained largely unchanged for hundreds of years. Bru; The philosophy of the brewery is to produce not only great tasting Irish craft beer, but that they are also 100% naturally brewed and chemical free. 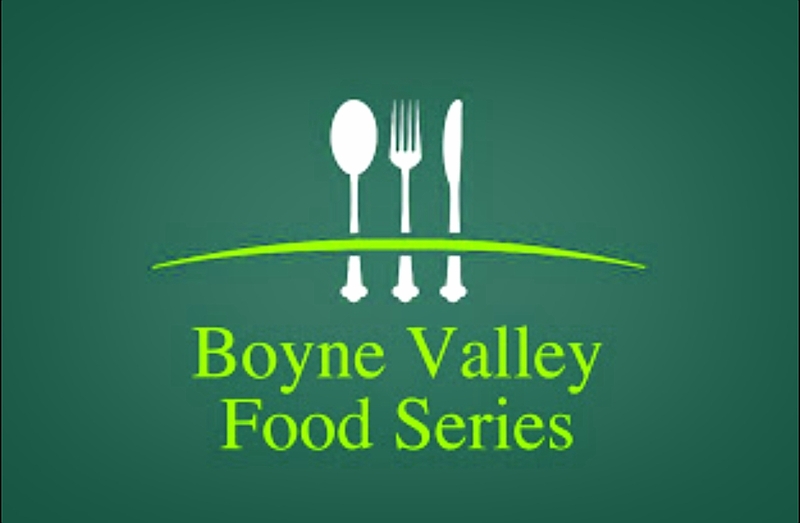 Olivia Duff officially launched the Boyne Valley Food Series 2015 by inviting producers and restaurateurs to tell their stories and promote their businesses. 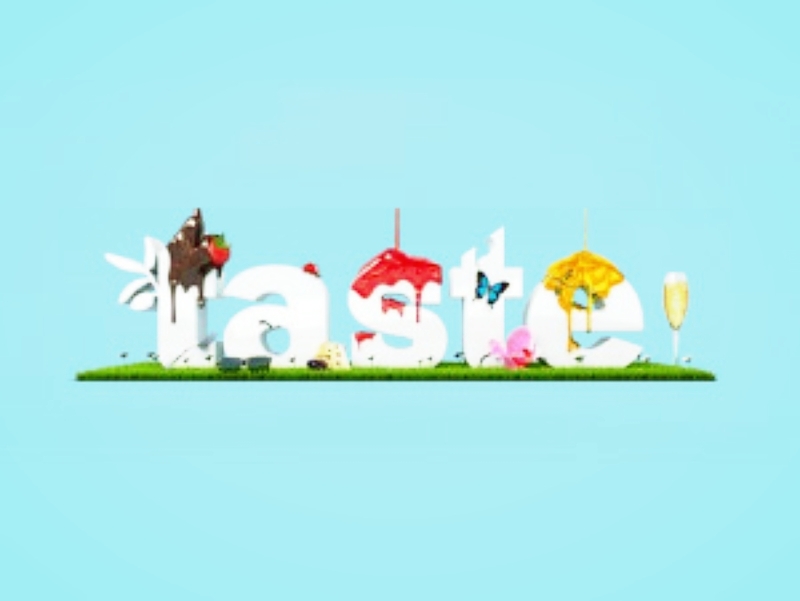 Over the past couple of years over 50 food related businesses have come together to hold events over the course of the Summer months. 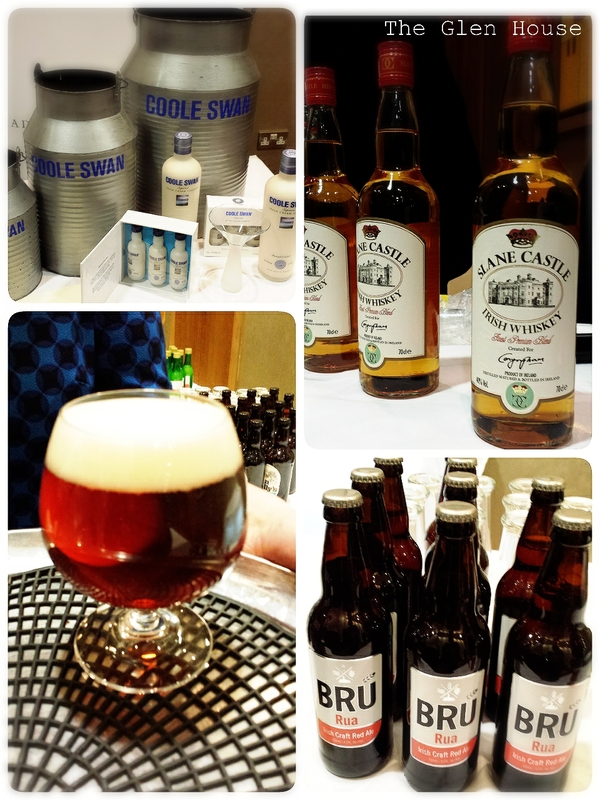 So on to the evening itself; there was a Pre-Dinner Drinks Reception with Stameen Farm Apple Juice, Dan Kelly’s Cider, Red Headed Ale, Coole Swan, Bru and Slane Castle whiskey. It was a first outing for Harvest Brewhouse Red Headed Ale, the drinks were from the first barrel of beer to be produced! To say that I was excited by the time we actually sat down for dinner is an understatement! The room was beautifully decked out, and throughout the evening blasts of the Corrs and Riverdance could be heard. To start us off, we had a selection of freshly baked breads from Slane Bake with Newgrange Gold oils and Blast and Wilde butters. All three producers are dear to my heart, so I knew I’d enjoy picking away (and I did)! 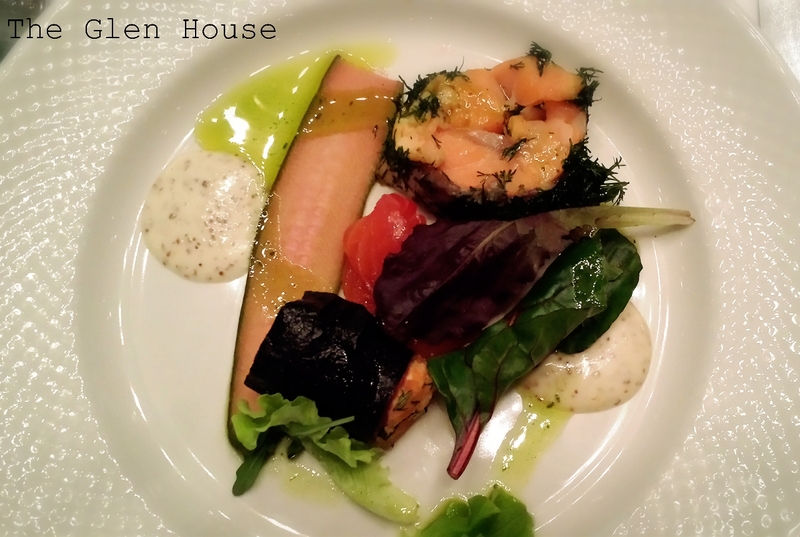 The starter was an assiette of Irish salmon, beetroot gravadlax, ballotine, seaweed roulade from Morgans Fine Fish. It was simply stunning; so fresh and light that it convinced me that I’d be well able to munch my way through the next six courses! 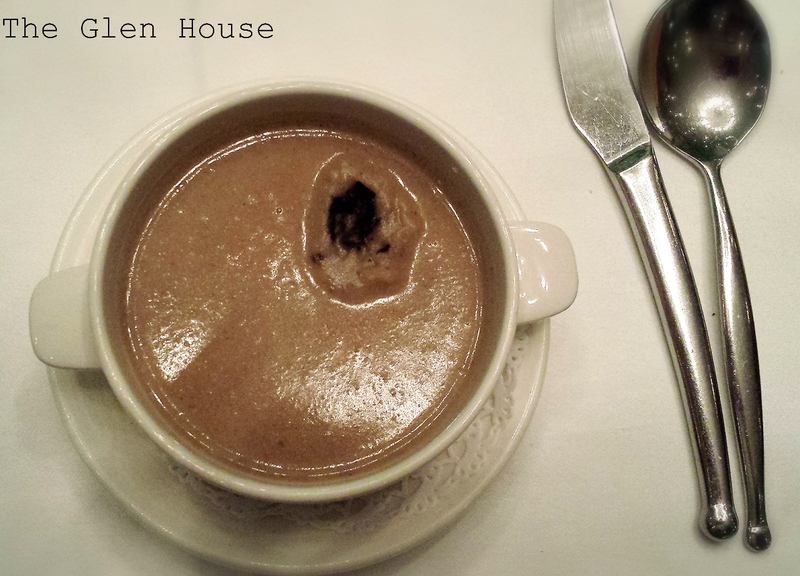 Now I’m not a soup fan and I’m not a mushroom fan, so I wasn’t really looking forward to the next course… However, the Kerrigan’s mushroom soup with mushroom wontons was delicious. 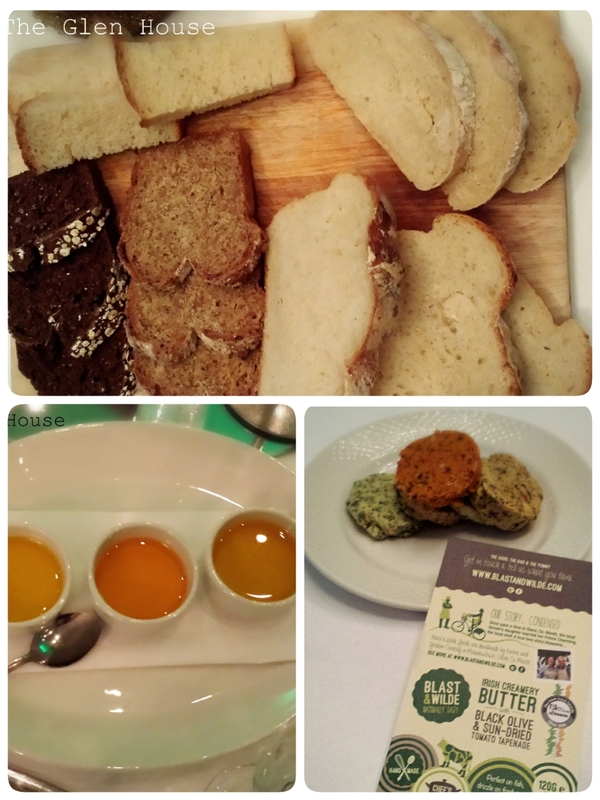 It was smooth and rich and beautifully accompanied by Slane Bake breads and Blást Wild Irish Garlic & Pesto butter. 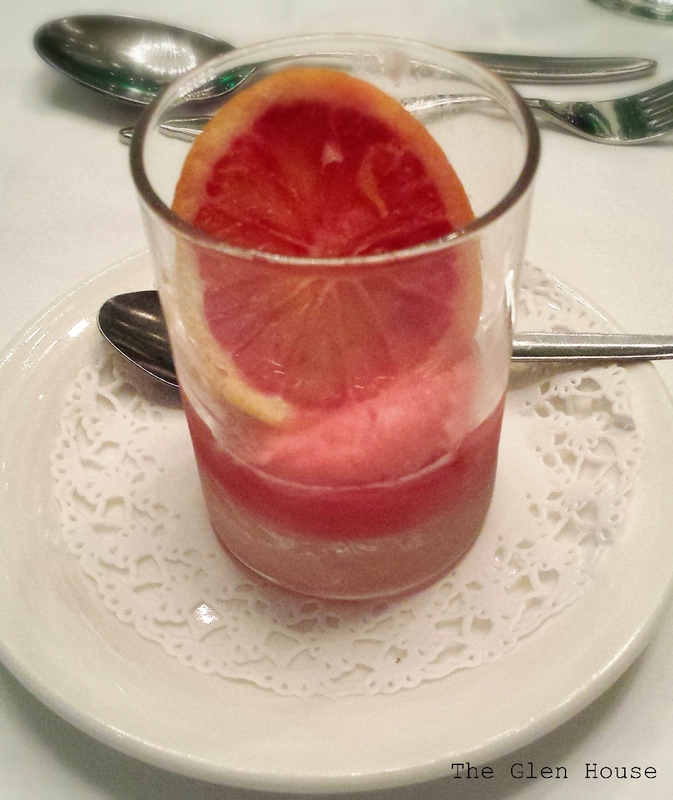 What came next was the highlight of my night, Burke’s farm blood orange sorbet. The refreshing treat held the amazing flavour of the seasonal fruit really well. I immediatley jumped onto their Facebook page to beg for a 50 litre tub! The main courses consisted of braised pork belly, black pudding, Bellingham blue cheese, sweet potato fondant and a bittersweet sauce, (produced by The Whole Hoggs, Dan Kelly’s Cider, Glyde Farm and Meade Potatoes). Or a pan fried cod, crab risotto, spring onions, bisque sauce produced by Morgans Fine Fish. 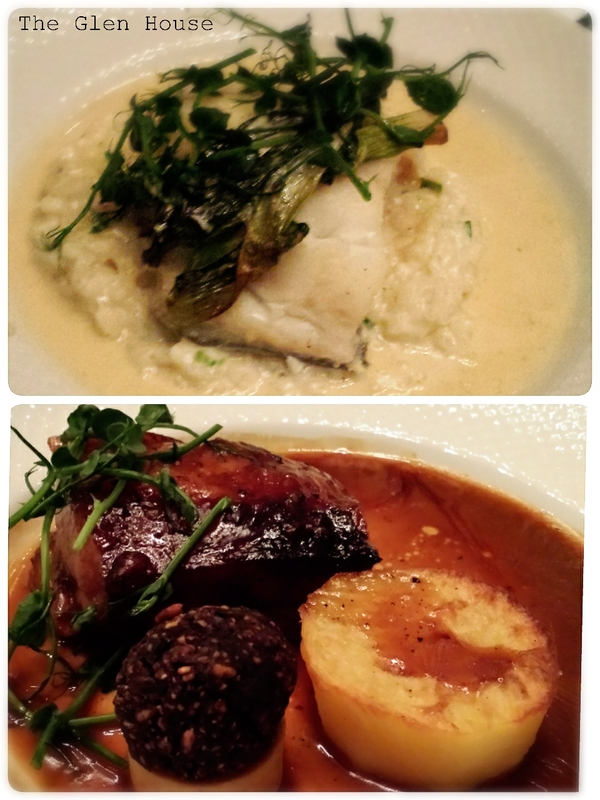 Both mains were served with farm fresh carrots, cabbage and swede and baby roasters from Meade Potatoes. The majority of guests opted for the pork belly (as I did), and it didn’t disappoint. I loved the black pudding which seemed to have a hint of cumin through it, which cut through the rich pork belly perfectly. 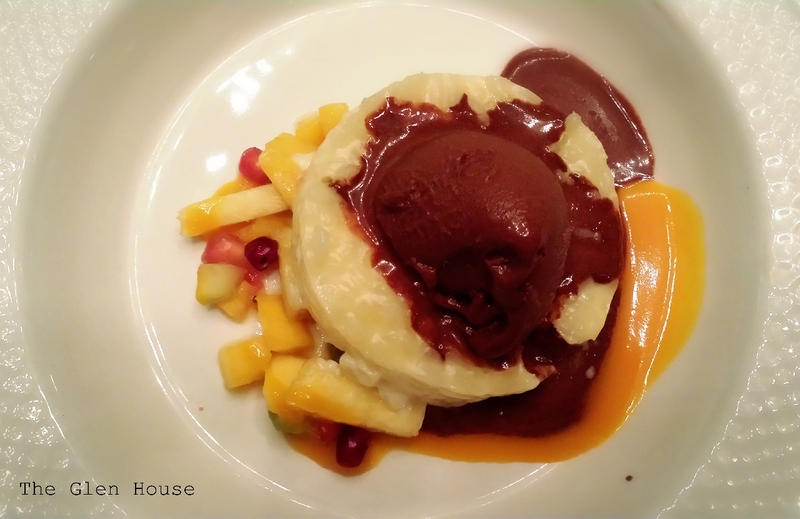 The dessert was a slightly warm coconut rice pudding, exotic fruits, with Burke’s Farm bitter chocolate sorbet. The rice pudding was almost set like a cake and was complimented perfectly by mango and pineapple along with the dark, bitter chocolate. As a fellow guest commented, it had a slight “Bounty flavour” about it. 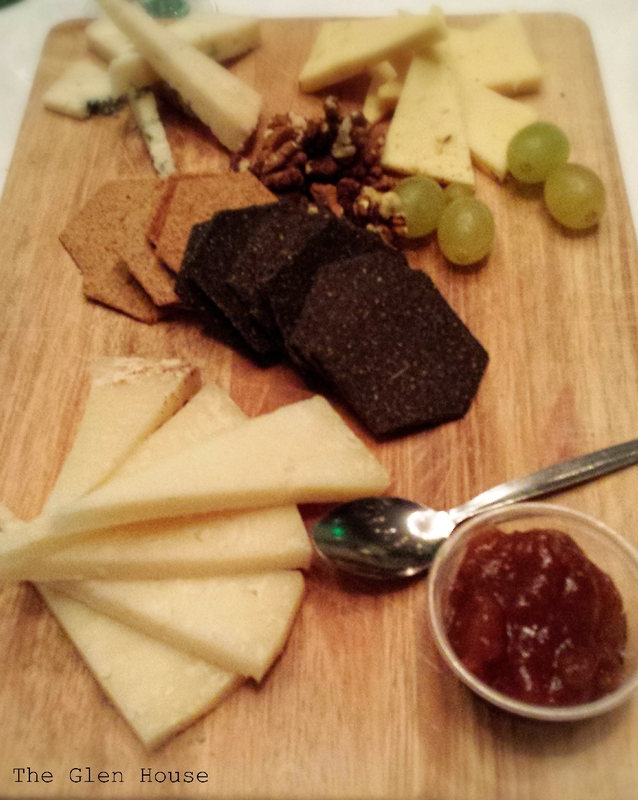 With bowls cleared away, a board of local cheeses was produced; Boyne Valley Blue, Bellingham Blue and Glebe Brethan were served with Sheridan’s crackers and chutney and Lannléire honey. Finally, there was tea and coffee along with chocolates by Chez Emily. These little petit fours were just fabulous, I’ll definitely be visiting the local shop. As if all that weren’t quite enough, there was a final round of Coole Swan. I must admit that I’d never tasted the liqueur before last Friday night, how did I miss out on it? As their little card says “Chocolate for pleasure, Coole Swan forever”, agreed! It was an unforgettable evening; I’m extremely proud to live in the Boyne Valley region, with its rich heritage and history and its magnificent produce. The countryside was abloom with magnificent creamy flat-topped sprays last month. 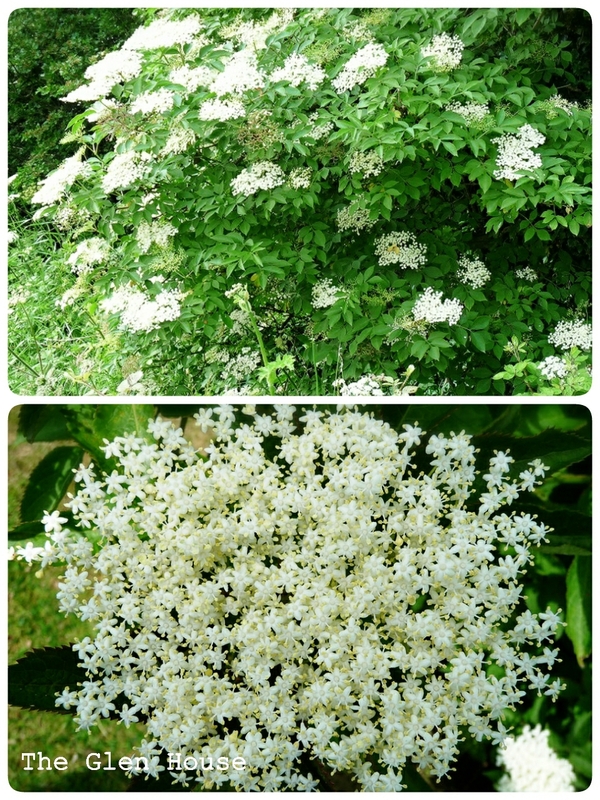 The sweetly scented flower of the Sambucus Nigra or Elderflower had arrived. Their heady sweet scent permeated country lanes, roadsides, graveyards, parks and gardens and these sprays (umbels), containing hundreds of tiny flowers, have more uses than any other single species of blossom. The delicate flavoured flowers with the aroma of Muscat grapes turn up in wines, cordials, sorbets, jams, deserts and sauces. Elderflowers bloom for about three/four weeks and are not only valued for their culinary use, but also prized for their medicinal qualities. 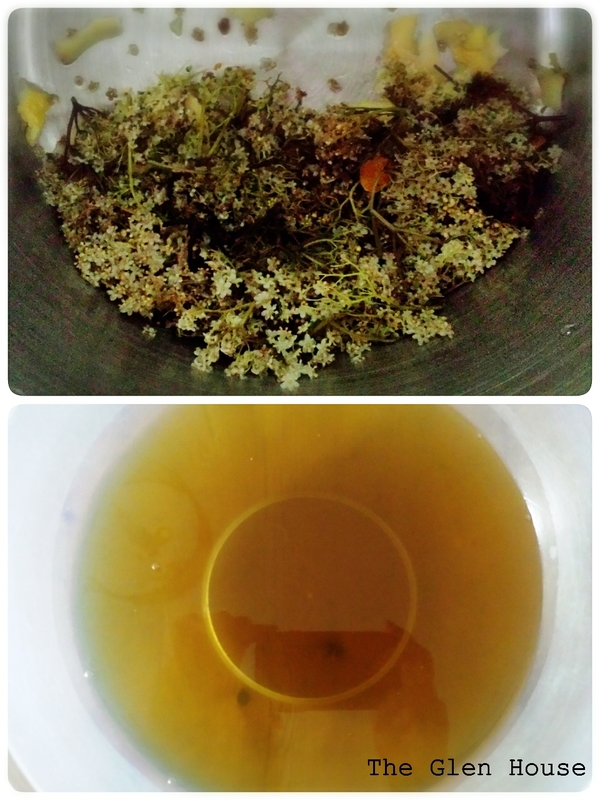 Elderflower extract is used in a wide variety of vitamins and tonics, in skin ointments and eye lotions. Elderflowers are also rich in Vitamin A, B and are used for the treatment of colds, flus and hayfever. 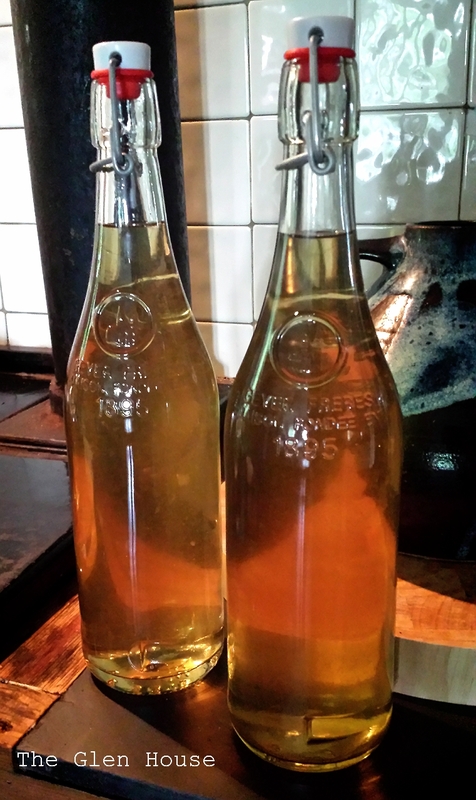 Dr Doolittle used a River Cottage recipe to make a delicious Elderflower cordial. He found that this recipe had a lot less sugar than all the other recipes. Strain the liquid through a scalded jelly bag or piece of muslin and pour into a saucepan. Add the sugar, the lemon and orange juice and the citric acid (if using). 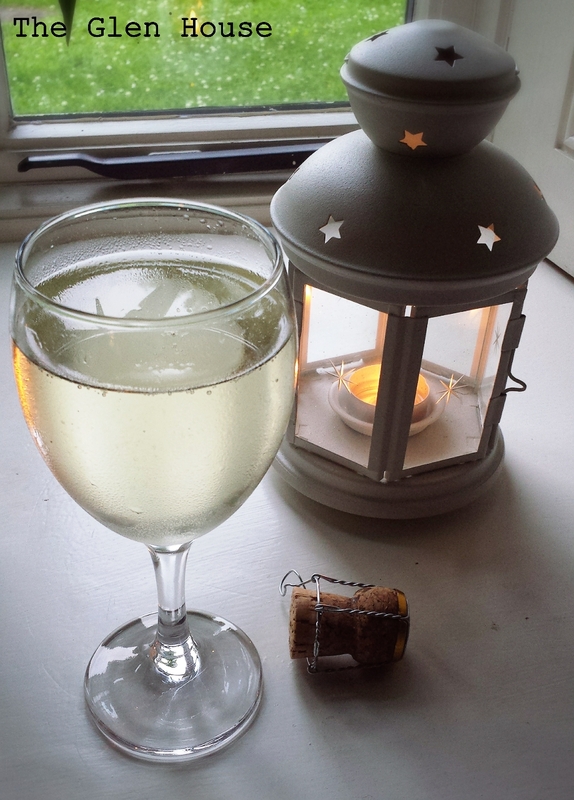 The first night we tried it with sparkling water, which was nice…. The second night we tried it with sparkling wine and it was gorgeous! The Glen House garden is truely amazing, it never fails to inspire me. To share the love, I’m bringing a bottle of cordial to Angie’s for the Fiesta Friday party at the novice gardener.